It would appear that I have made garlic candy. I'd found a recipe for preserved garlic on one of the blogs I follow, and had thought it sounded really good so I wanted to try it. 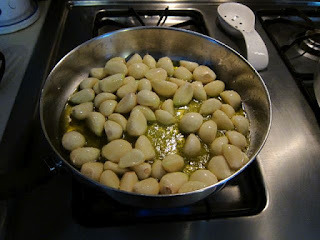 Yesterday at the farm there was "hardneck" garlic, and lots of it. I grabbed 14 heads as it was part of the mix and match so you could take as much as you wanted as long as it fit in 2 big bowls. I should have gotten a few more, as I only ended up with 4 cups of cloves, not 5. Silly me, thinking 14 heads of garlic was sufficient! 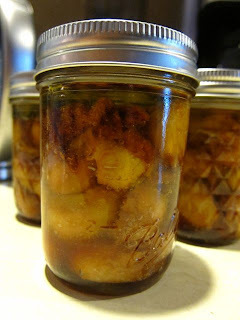 After laboriously peeling all the cloves, I sent my husband to 3 different grocery stores to find sherry vinegar while I cooked the cloves in the olive oil and salt and then caramelized them with the sugar. The addition of the vinegar deglazed the pan and made everything smell so rich and complex. After I put up 3 half-pints of the garlic I scraped some of the sugary residue off the pan. Garlic candy indeed! In addition to this project, I made some tabouli salad and started a basic sauerkraut using a recipe for "Wine Kraut" from The Joy of Pickling. It's fermenting, I hope. Tomorrow I add some wine. And then I wait. Served some with a lamb roast for Easter dinner. The garlic *melted* onto the meat. Wow.